L’Shanah Tova! Happy (Jewish) New Year! Yes, I’m late. Also, a bit lazy, so here’s a repost to tide everyone over. As many of you already know, we are entering into the fall High Holy Days, comprised of the Feasts of Trumpets, Atonement, and Tabernacles. Just as the spring Feastdays celebrate the First Coming of Messiah Yeshua, and Shavuot (Pentecost) celebrates the giving of the Ruach HaKodesh (the Holy Spirit) to the Ekklesia in between the visitations of Yeshua, the Fall Feastdays look forward to His Second Coming—and in particular, the Feast of Trumpets looks forward to His Glorious Appearance in the clouds of heaven! The day which this year falls on September 21 (beginning at sundown the previous night) is known by many names, but is little understood. The most commonly used today is Rosh Hashanah, the Head of the Year or New Year, and is regarded as the start of the Jewish civil calendar. (The religious calendar begins on the first of Nisan, fourteen days before Passover, in accordance with Exo. 12:2.) For this reasons, Jews will greet each other with the phrase, “L’shana tova u-metukah,” “May you have a good and sweet new year” or simply “Shanah tova,” “A good year.” In anticipation of this sweet new year, it is customary to eat a sweet fruit, like an apple or carrot dipped in honey. The Talmud records the belief that “In the month of Tishri, the world was created” (Rosh Hashanah 10b), and its probably due to this belief that it became known as the Jewish New Year. The belief that the world was created on Rosh Hashanah came out of an anagram: The letters of the first word in the Bible, “In the beginning . . .” (B’resheit) can be rearranged to say, “1 Tishri” (Aleph b’Tishri). Perhaps because so little is directly said in Scripture about this day—unlike all of the other Feastdays, there is no historical precedent given to explain why Rosh Hashanah should be celebrated—the rabbis also speculated that Adam, Abraham, Isaac, Jacob, and Samuel were all born on this day. In each of these passages, I’ve placed “trumpets” in brackets because it’s not actually in the Hebrew text; however, teruah can and usually does mean to sound the trumpet (though it can mean to shout with a voice as well) and the use of a trumpet on this day is considered so axiomatic that there is literally no debate in Jewish tradition on the matter. Specifically, the trumpet used is the shofar. The shofar is traditionally always made from the horn of a ram, in honor of the ram that God substituted for Isaac, and never from a bull’s horn, in memory of the sin of the golden calf. The shofar first appears in Scripture as heralding the visible appearance of God coming down on Mt. Sinai to meet with His people (Ex. 19:16-19). It is also linked with His Coming in Zec. 9:14 and with Him going up (making aliyah) to Jerusalem in Psa. 47:5. Small wonder then that Yeshua said He would Come again with the sound of a trumpet, a shofar, in Mat. 24:31, which is echoed by Sha’ul (Paul) in 1 Th. 4:16 and 1 Co. 15:52. Indeed, many commentators have recognized that by “the last trump,” Sha’ul was referring to the final shofar blast, called the Tekia HaGadol, of the Feast of Trumpets. Though an host should encamp against me, my heart shall not fear: though war should rise against me, in this will I be confident . . .
For in the time of trouble He shall hide me in His pavilion: in the secret of His tabernacle shall He hide me; He shall set me up upon a rock. . . 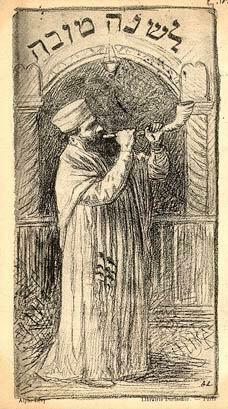 The shofar is an instrument that is very much associated with war (Jdg. 3:27, 2 Sa. 20:1, Neh. 4:18-22, Ezk. 33:3-6). It was used to destroy the walls of Jericho (Jdg. 6:20). In Joel 2:1, it sounds the start of the Day of the Lord, the time in which God will make war on His enemies: “Blow ye the trumpet in Zion, and sound an alarm in My holy mountain: let all the inhabitants of the land tremble: for the Day of the LORD cometh, for it is nigh at hand” (cf. v. 15). This again matches perfectly with the NT, where Sha’ul describes the Lord’s coming with a trumpet immediately preceding the Day of the Lord (1 Th. 4:16, 5:2). This brings us to the next name for this Feastday, Yom HaDin, Judgment Day. Not only did the shofar sound the call for war, but also the coronation of kings (2 Sa. 15:10; 1 Ki. 1:34, 29; 2 Ki. 9:13, 11:12-14). Therefore, the rabbis have always associated this day with God’s sovereign Kingship over all mankind: “On Rosh Hashanah all human beings pass before Him as troops, as it is said, ‘The LORD looketh from heaven; He beholdeth all the sons of men. From the place of His habitation He looketh upon all the inhabitants of the earth. He fashioneth their hearts alike; He considereth all their works’” (Rosh Hashanah 6b, quoting Psa. 53:13-15). To remember God’s Kingship, it is traditional to eat round objects to remind us of God’s crown (oriental crowns being shaped as skullcaps instead of circlets). For example, challah is made to be round instead of braided as it normally is. Because this day is associated with God’s judgment, it is also considered a time of repentance (t’shuva) in preparation for Yom Kippur. The Casting (Tashlikh) Ceremony, in which observant Jews gather together at the shores of oceans, lakes, and rivers and cast in stones and/or crumbs of bread to symbolize “casting off” their sins, is performed on this day to a prayer comprised of Mic. 7:18-20, Psa. 118:5-9, Psa. 33 and 130, and often finishing with Isa. 11:9. The Bible, of course, is clear that one is written in the Lamb’s Book of Life (cf. Php. 4:3; Rev. 3:5, 13:8, 17:8, and 21:27) not by one’s own righteousness, but by receiving the Messiah’s righteousness by faith, trusting in Him, and that there is no in-between; one either trusts God or one doesn’t. Nevertheless, a great eschatological truth is preserved for us in this rabbinical tradition. At the time of Yeshua’s Second Coming, all mankind will be divided into three groups. Those who have already trusted in the Messiah will be Resurrected and Raptured to be with Him immediately upon His Coming on the clouds of the sky. Those who have taken the mark of the Beast and have chosen to remain with the Wicked One will be slated to die in the Day of the Lord, which for reasons that are beyond the scope of this essay to address, I believe will last for about a year. However, there will also be a third group, who neither had believed in the Messiah until they saw Him Coming on the clouds but who also had not taken the mark of the Beast. Many of these will be Jews, who will mourn at His coming and so have a fount of forgiveness opened to them (Rev. 1:7, Zec. 12:10-13:2)—most prominently, the 144,000 of Rev. 7 and 14. Others will be Gentiles who will be shown mercy because they showed mercy to the children of God (Mat. 25:31ff). These are given the opportunity to repent during the period between the fulfillment of the Feast of Trumpets and the Day of Atonment, called the Days of Awe—a reference, I believe, to the Day of the Lord. Finally, this day is known as Yom HaKeseh, the Hidden Day. It was a day that could not be calculated, only looked for. Ancient Israel kept its calendar simply by observing the phases of the moon. If a day were overcast, it might cause a delay in the observance of the beginning of the month, the new moon (Rosh Chodesh), the first tiny crescent of light. Every other Feast was at least a few days after the beginning of the month so that it could be calculated and prepared for in advance. For example, after the new moon that marked the beginning of the month of Nisan, the observant Jew knew that he had fourteen days to prepare for the Passover. Not so Yom HaKeseh. In the absence of reliable astronomical charts and calculations (which were made only centuries after God commanded the Feasts to be observed), the Feast of Trumpets could be anticipated, estimated to be arriving soon, but until two or more witnesses reported the first breaking of the moon’s light after the darkest time of the month, no one knew “the day or hour.” Therefore, it was a tradition not to sleep on Rosh Hashanah, but to remain awake and alert, a tradition alluded to by Sha’ul: “But ye, brethren, are not in darkness, that that day should overtake you as a thief. Ye are all the children of light, and the children of the day: we are not of the night, nor of darkness. Therefore let us not sleep, as do others; but let us watch and be sober” (1 Th. 5:4-6). Because of the difficulty of alerting the Jews in the Diaspora when the Sanhedron had decreed the start of the Feast to be, it became traditional to celebrate the first and second day of Tishri together as Yoma Arikhta, “One Long Day.” Is this meant to remind us, perhaps, of when another Y’hoshua (Yeshua) won against his enemies because God cast down great hailstones (like the hailstones of Rev. 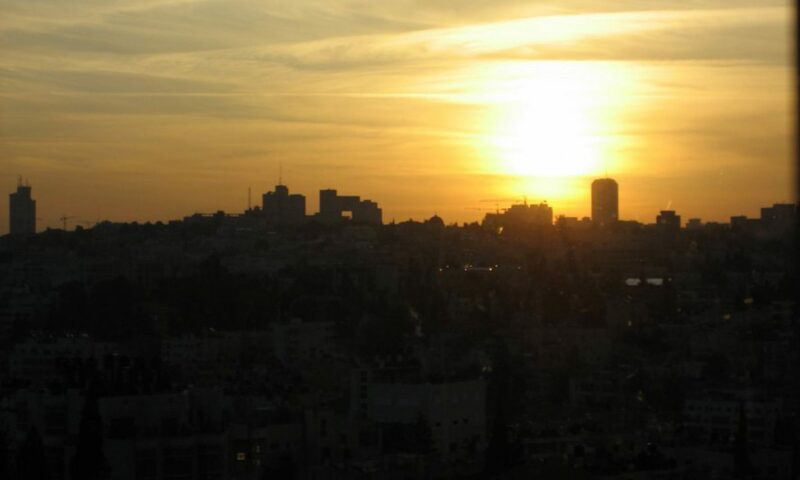 16:21) and called upon the Sun to stand still so that they would not escape (Jos. 10:10ff)? Yom Teruah is a day which ultimately calls all of God’s people together in repentance in anticipation of the glorious Second Coming, in which He will once again visit His people in the Person of the Messiah Yeshua to Resurrect the dead, awaken the living, and judge all mankind together. Previous PostPrevious Hall of Shame? Or Hall of Shem?